The Bahamas is a coral-based archipelago in the Atlantic Ocean, located south-east of Miami, Florida. The Bahamas is an archipelagic state of the Lucayan Archipelago comprising of over 700 islands, islets and cays ranging from unsettled to packed with resorts. The Bahamas is a popular Caribbean vacation destination that caters to families, singles, groups and even couples with a variety of resorts, beaches and water-sports activities. The Islands of Bahamas attracts millions of visitors to their white-washed shores, luxurious accommodations, duty-free shops and watersports excursions annually. The visitors that flock the Bahamas regularly wallow in the diversions of the all-inclusive mega resorts, but this diverse chain of Islands offers much more activities away from the resort zones. Nature lovers can explore the wildlife preserves and offshore reefs and golf enthusiasts can for unlimited golf courses. Visitors also love patrolling the marketplaces for the best deals at the duty-free boutiques. Take your animal-loving kids to the Dolphin Experience on Grand Bahama Island, where they can get to interact with some friendly bottlenose dolphins in one of the Caribbean’s largest diving programmes. Recent visitors brag about how friendly and informative the staff are as well as the well-behaved aquatic creatures. Visitors also love the compassionate, open-water swim and claim that the expensive interactive program is worth every penny. Tickets for the Dolphin Experience are available at the Underwater Explorers Society, located in Freeport. Cable Beach in the Bahamas is not the most glamorous, but it is well equipped. Situated between the airport along New Providence's North Coast and Nassau, the stretch of coastline is nearby to golf courses, restaurants and casinos. 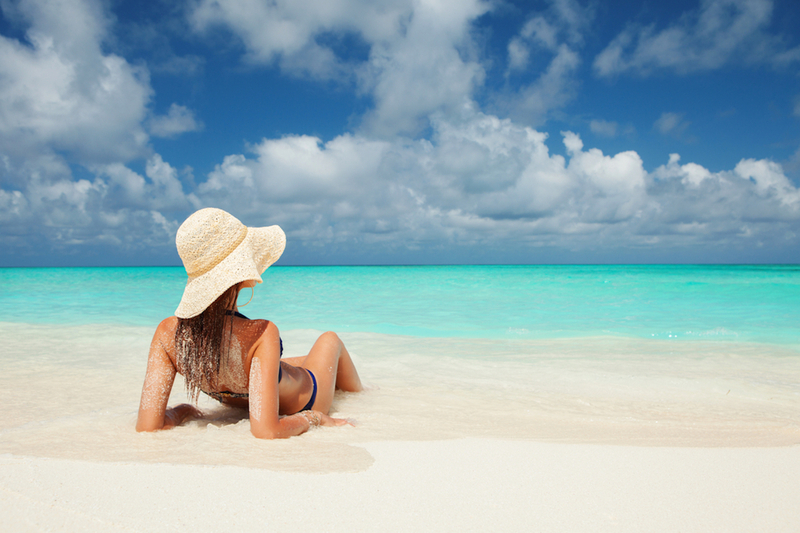 Travellers also admire the view a lot especially the crystalline Caribbean Sea and white sands. With all the restaurants and beachfront accommodations, cable beach tends to get crowded really quickly so prepare for crowds. If you are planning to stay elsewhere in the Bahamas, Cable Beach os more than worth the day trip. But if you want a lodging near Nassau, you should definitely consider a cable beach resort. Where else can you find 14 Lagoons, numerous caves and over 50,000 marine animalism one place? Probably not a lot of places. The Marine Habitat at Atlantis may be your big opportunity to visit a giant marine life complex. Interact with sea turtles in the Hibiscus Lagoon, let and feed stingrays or ride through an underwater tube in the shark habitat. You can also swim with dolphins are get to meet a sea lion — the options are limitless. The habitat is perfect for animal-loving children, and kids are also easily entertained during the day. Feeding time is the crowd favourite for visitors where they get to feed the eels and manta rays. The admission to enter the habitat is around $110 USD for adults and $80 USD for kids. This top scuba diving and snorkelling reached Hollywood notoriety for its appearance in two James Bond films (“Never Say Never and “Thunderball”). Encompassed sky-high cave ceilings enclose the serpentine, underwater maze located on Staniel Cay with vents just big enough to let through sunlight and reflect off the water. If you are an experienced diver, you should have no problem navigating through Thunderball, but most travellers recommend that rookie snorkelers and divers plan their excursion during low tide. If you wish to see some big fishes, many suggest you swim near the ocean floor. Fishes will likely swim up to you in search for food, so remember to pack some breadcrumbs for feeding time. Grand Bahama has three national parks, but Lucayan National Park is the undisputed favourite. A 40-acre stretch of mangroves, pine and palm trees, Lucayan National Park, located in Freeport also contains lovely white sand beaches, the amazing Gold Rock Beach and one of the world’s longest underwater limestone caves. You will need at least several hours to explore both underwater caves — one of which is where Lucayan people’s bone were found in 1986 — and to swim at the secluded Gold Rock Beach. You can also ride horses in the park or go kayaking. Nassau is one of most popular cruise ship ports in the Caribbean, Nassau still manages to attract travellers despite the camera-toting tourists and large crowds. Visitors come here to enjoy the powdery white sands of Cable Beach; explore the restaurants, shops and museums and rainbow-colored colonial architecture of downtown and Bay Street; and shop for souvenirs at the Nassau Straw Market. A quick cat-cruise away from Nassau, animal lovers can interact wit dolphins on an excursion to Blue Lagoon Island, while Ardastra Gardens, Conservation Center and Zoo also offers a slower pace, with it's threatened and endangered species on four acres of tropical gardens. About five hours away is Paradise Island, home to the famous Atlantis Resort. The most northerly of Bahamian Islands, Grand Bahama is one of the most popular tourist's destinations in the Caribbean for a Vacation package tourists and cruise ships. The capital, Freeport, is Bahamas’ second largest city and is a tourist hub for, shopping, entertainment and dining. Port Lucaya Marketplace sells straw goods, jewellery as well as other souvenirs, and the marina is a meeting place for boaters and tourists. Despite being the home of the Island’s large all-inclusive resorts and hotels, it is still very possible for you to get away from large crowds. Grand Bahama is home to the Thunderball Grotto and three national parks including the Lucayan National Park. Controlling the majority of the Skyline on Paradise Island, this salmon-pink, splashy resort vividly recreates the legend of Atlantis in a luxurious resort, waterpark, aquarium and entertainment complex. Guests of Atlantis score free access into the famous 141-acre Aqua-venture, over 20 swimming areas, a water park packed with high-speeds slides, and an extended Lazy River Ride. In the marine habitat, swordfish and hammerhead sharks swim through crystalline open-air pools. Guests will also find restaurants, shops, and entertainment venues on location. The fairytale sea theme continues throughout, capturing the imagination of old and young alike. The elegant Harbour Island, northeast of its big sister, Eleuthera, is one of the most ancient settlements in the Bahamas, as well as the first Bahamian legislature; English Loyalists lived in Harbour Island in the 1700s. 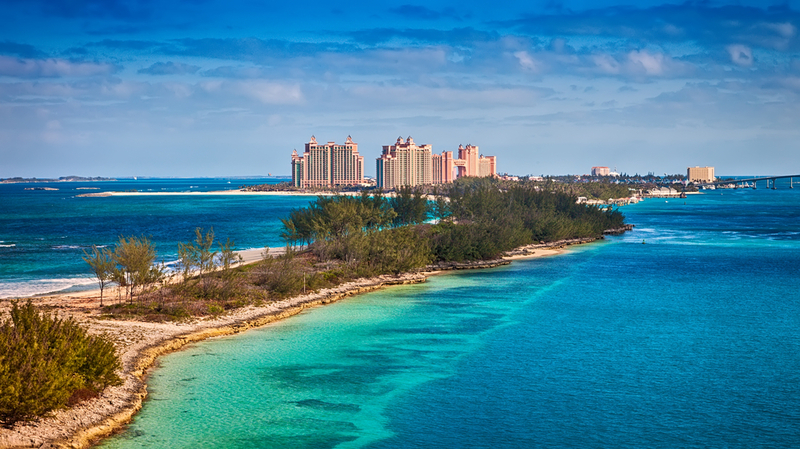 Known for its pink sand beaches and stylish resorts, the island which is dearly known by Bahamians as “Briland,” always has been a hideout for the rich and famous. Golf carts dominate the streets here, and visitors feel as though they've strolled back in time as they cruise past the exquisite, pastel-coloured Loyalist architectures bordering the streets of Dunmore Town, the island's one and only settlement. Popular activities include snorkelling, diving, fishing and enjoying the pink sand beaches of Harbour Island. 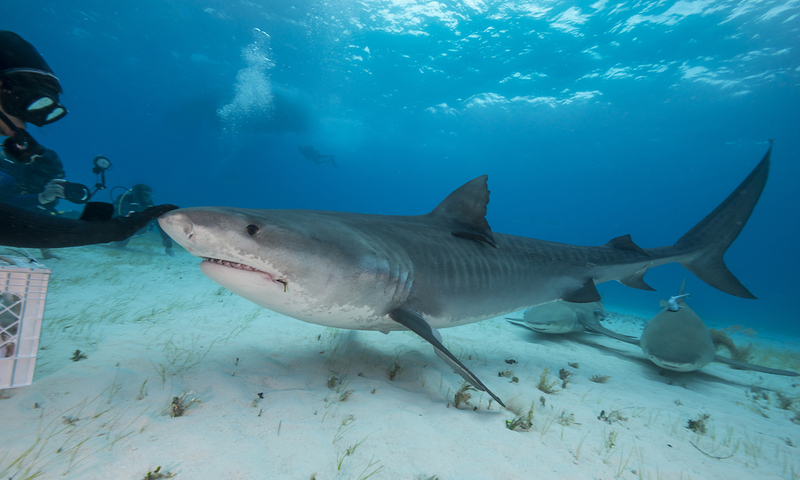 n the isolated eastern edge of the Bahamas Islands, the Exuma Cays Land and Sea Park is a “no-take zone” and a protected marine area, the first in the Caribbean. The park features some of the most attractive seascapes in the Bahamas, with glistening water in shocking blues and chalk-white sand. The area is well-known among boaters and divers, who come here to enjoy the anchorages, limitless marine life and the crystalline Caribbean Sea. On a fair day, divers and snorkelers can enjoy 30-meter-plus visibility. 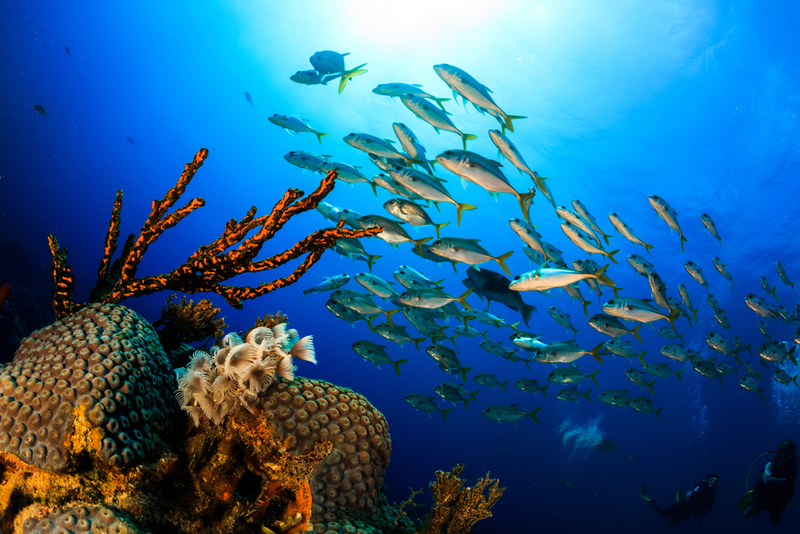 Most people explore the underwater paradise on boats or live abroad dive charters. No fishing or vending is allowed in the area. The Exuma Cays are so gorgeous. Some of the Islets are homes to Hollywood stars like David Copperfield and Johnny Depp, while others are home to exclusive resorts. The largest of the Exumas, Great Exuma, and Staniel Cay are popular with boaters who come to enjoy the cheerful restaurants. Long Island is one of the most beautiful islands in the Bahamas, it is situated a little off the beaten path, in the southern half of the Bahamas Islands. About 130 km long but no more than 7 km wide, the island is a land of diversity, with steep rocky cliffs on the East and sandy beaches on the West coast. Long Island is a fisher's paradise and also for boating, diving, and it also boasts extensive stretches of white sand beaches. Long Island is also the home to Blue Hole, the deepest saltwater blue water in the world that is known to man. You can access the land by air shuttle from Nassau.